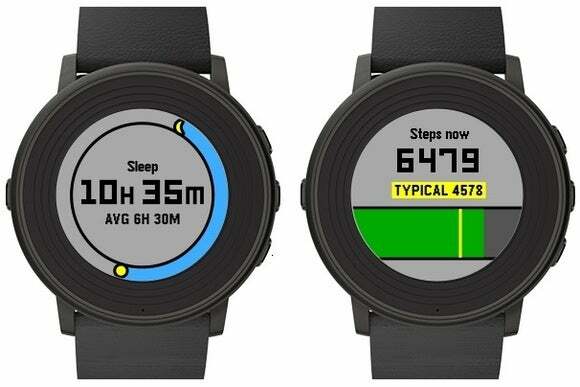 The new app for step and sleep tracking supports the Pebble Time’s color display and Timeline feature. Pebble is making it easier to keep track of fitness goals with an update to its latest smartwatches. With the new Pebble Health app, users can count their steps and get automatic sleep tracking on the Pebble Time, Pebble Time Steel, and Pebble Time Round. The app presents a running average of the user’s activity, along with weekly step and sleep graphs. Both measurements can feed into Apple’s HealthKit or Google Fit for viewing on a smartphone and correlating data with other fitness apps. Although Pebble already offers fitness tracking from third-party apps such as Misfit and Jawbone, those apps have done a poor job of supporting the latest Pebble hardware. Neither app has utilized the color displays on the Pebble Time, Time Steel, and Time Round, and Jawbone doesn’t work at all with the Time Round’s circular screen. By comparison, Pebble Health looks great on all of the company’s latest watches. It also supports Pebble’s Timeline feature, which lets users scroll backward and forward through time to view relevant information. In the mornings, Timeline will show users how much they slept, and in the evenings, users will get a summary of how many steps they’ve taken. Although Pebble’s fitness-tracking features are pretty basic for now, it sounds like they’ll improve over time with insights on how users can do better. A forthcoming API will let third-party app makers tap into Pebble Health data, and Pebble is also working with Stanford University’s Wearable Health lab on bringing its data collection algorithms to researchers. Unfortunately, Pebble Health won’t be available for the original Pebble and Pebble Steel. Users of those watches will need to rely on third-party apps such as Misfit and Jawbone. Why this matters: Fitness tracking has become a table stakes feature on smartwatches, as it is already built into the Apple Watch, Android Wear watches, and Samsung’s Gear S2. Pebble is playing a necessary game of catch-up here, especially with third-party fitness apps showing lackluster support for the platform.